Chest infections can be categorised into acute bronchitis (an infection of the large airways into the lung) and pneumonia (an infection of the lung). Most cases of bronchitis are viral in their nature and require no treatment. Antibiotics have no impact on viral infections so administration of antibiotics will make no difference to your recovery if you have a viral infection. Pneumonia is usually bacterial and does require antibiotic treatment. If you have a persistent chest infection but your symptoms are not too serious then The Online Clinic can help. The Online Clinic can prescribe antibiotics online if we feel that this is appropriate. There will be some cases that require a face to face consultation with your own GP and some cases where we may feel that antibiotic treatment would not be beneficial. 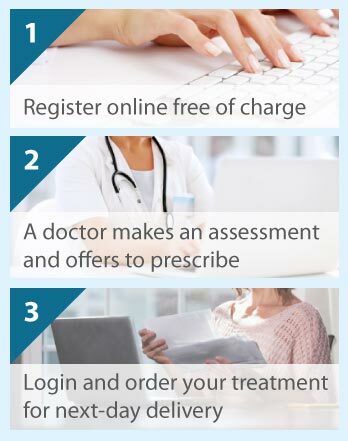 Please click on the Free Assessment button below so that we can provide appropriate advice and perhaps offer a prescription for next day delivery. Symptoms will normally persist for around 10 days but can take up to 3 weeks to clear. If your symptoms persist for longer than this then the infection may have spread and you may require treatment. Pneumonia is a serious infection of the lungs and antibiotic therapy is usually required. If you are otherwise healthy then this therapy can be administered at home. If the symptoms are more serious then you may be required to be admitted to hospital. If your symptoms are mild then you will not normally require any treatment. You should get plenty of rest and you can take something like ibuprofen or paracetamol or aspirin to reduce any fever and help with aches and pains. Do not take cough remedies as they are likely to be counter-productive. Drink plenty of fluids and avoid lying flat when you are sleeping. If your symptoms are persisting beyond the normal prognosis times outlined above, we may be able to help but in more serious cases, you should see your GP.